In all my years sailing on Eastern Long Island, it always amazed me that there wasn’t a distance race going east out into the ocean. We have lots of weekly racing in our beautiful bays and we have our big, end-of-the-season Whitebread Race, but that’s only 35 miles. If you wanted to do a distance race, you had to go to Western Long Island Sound or to Rockaway for the Around Long Island Regatta. In 2008, I decided to do something about it. I talked to some yacht clubs and my sailing friends about organizing a race out to Block Island and back. Then I was at a cocktail party and someone said to me, “Jim, I heard you’re reviving the old Brooklyn Ocean Challenge Cup.” I had no idea that I was doing that, but now that was my mission. 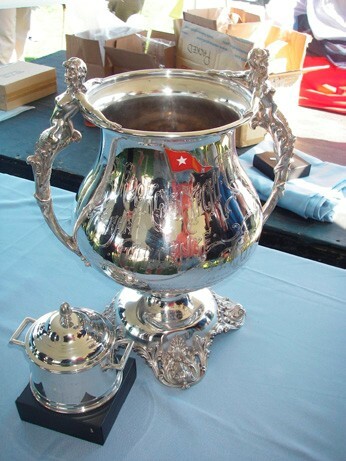 I found out that the Brooklyn Ocean Challenge Cup was a large silver cup donated in 1904 to the Brooklyn Yacht Club by William Randolph Hearst, the newspaper tycoon. The purpose of the cup was to encourage ocean distance racing, and the first race for the cup in 1905 was from Brooklyn to Hampton Roads, Virginia. The cup came to eastern Long Island in the 1950s and there were some ocean races, but after 1979 nobody seemed to know where the cup was. As I worked to organize the race from Greenport to Block Island and back, I also tried to find out whatever happened to this beautiful trophy. Then one day I got a phone call from a member of the Chinese Yacht Club in Greenport, New York. We scheduled a meeting that included representatives from a few of the East End yacht clubs as well as a representative from the Village of Greenport. There was the cup, sitting right on the table. Spectacular!! The cup was coming out of retirement. We agreed that the Chinese Yacht Club and Old Cove Yacht Club would sponsor the race, the Village of Greenport helped with a trophy and with the use of their marina, Shelter Island yacht Club and Orient Yacht Club donated trophies, and we had our first Greenport Ocean Race in 2008. The first new name to be added to the cup was Michael LaChance, sailing his J/105 Dark ‘n Stormy. The Greenport Cup, awarded to the first boat to finish, was won by Brendan Brownyard’s Swan 42 Barleycorn. The original plan in 2008 was to start in late afternoon and finish in the early morning, so that we’d leave and return in some light. I figured that sailing almost 90 miles would take a while. I was wrong. All the boats finished between midnight and 4am. The poor race committee was out there all night. So much for the late afternoon start. The next year we started at 1pm and the race and RC work were much more civilized. In the first six years of the race we had it start on a Friday, thinking that if it took too long everyone would still make the awards party on Sunday. We finally realized last year, with six years’ experience, that everyone will finish in a reasonable time, so we moved the race to Saturday. The move to Saturday was a big improvement. Along with changing the day, we changed the start time to 9am. Some of us that had done the race every year were able to figure out that a night race in October was rather chilly. With a start time of 9am, boats would be finishing in the early evening. That’s when we came up with the idea of a pub crawl as well as the addition of a Bay Race. The Bay Race started at 10am and did a sort of reverse of the Whitebread, going around both Robins Island and Shelter Island. The plan was that the shorter Bay Race would also finish in the late afternoon. We figured that with all these sailors arriving back in Greenport early Saturday evening, we had to have something to do. Mitchell Park Marina is right in the middle of downtown Greenport, so we arranged with nine restaurants, all within walking distance, to give a couple of free beers per boat, and a pub crawl was born. Last year, Ian, the owner of North Fork Oysters, said he was about to close five different times and each time he saw another group of sailors coming. He finally closed at 2am. As the race has improved every year, so has Sunday’s awards party. The North Fork is such a great place to live and sail, so we take advantage of what we have. We serve local craft beer from Greenport Harbor Brewery and local wine from one of the North Fork’s finest wineries, Lenz Winery. When I originally spoke to the owner of Lenz, he said “I’ll provide wine, as long as you serve it in glasses.” That gave us the idea of imprinted souvenir glasses. When you enter the party, you are given either a wine or beer glass. Everything tastes better and we actually have less cleanup. Our food last year was all cooked on-site and included filet mignon sliders, lamb shanks and pork tenderloins in addition to our raw clam and oyster bar. Not your average post-race fare. This year’s Greenport Ocean Race and Greenport Bay Race start on Saturday, October 10. 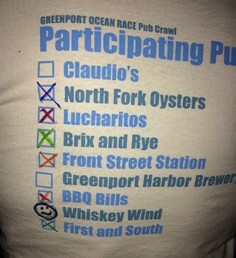 With one dollar-per-foot docking in Mitchell Park on Friday and Saturday night for participating boats, racing and The Greenport Ocean Race Pub Crawl on Saturday and the awards party on Sunday, this is not just a race. It’s a great weekend in what Forbes Magazine called one of America’s prettiest towns. To join us, go to greenportoceanrace.com. So, how on earth can we make this any better? It was hard to improve on last year’s event, but we did. We’re giving away a 7-day charter on a MarineMax 433 sailboat in the British Virgin Islands. Your race entry is your entry in the drawing for the free charter. We’ll put all the boat names in a bowl at the awards party and a winner will be drawn. All this leaves me with only one question. Why, with Swan 42s, J/122s, J/109s and J/111s competing, has a J/105 won the Brooklyn Ocean Challenge Cup seven years in a row? Jim Ryan is the Greenport Ocean Race Committee Chairman.